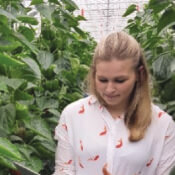 A family business, Gebroeders Van Egmond has years of horticultural knowledge and experience in plant cultivation. Previously growing lilies and tulips, the agribusiness switched to the year-round cultivation of Matricaria in the early 1990s. Matricaria is a a long-day plant that has to be illuminated in autumn and winter. Only three growers produce it year-round. CEO Job van Egmond joined the family business in 2017. In this video he explains how Gebroeders Van Egmond uses the 30MHz data platform to guarantee future growing quality.